Get Your SeaWolves Gear Here! Find out the latest on the SeaWolves in the commUNITY. The SeaWolves and Binghamton Rumble Ponies will play a doubleheader beginning at 1:35 p.m. One ticket is good for both games. 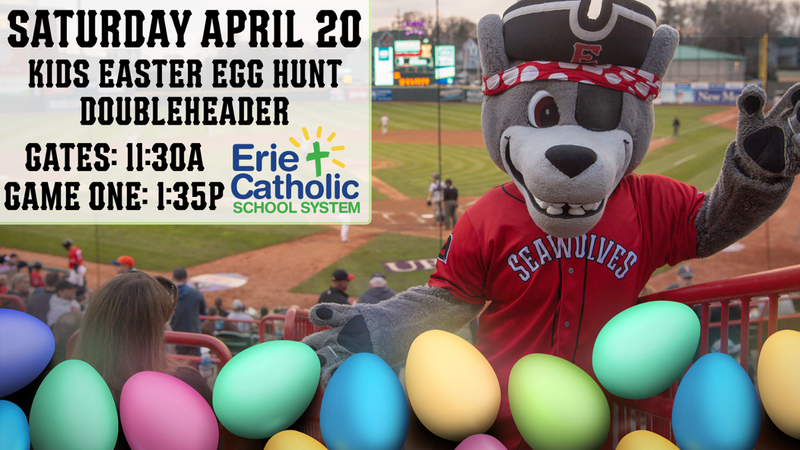 It's the biggest Kids Easter Egg Hunt in UPMC Park history presented by the Erie Catholic School System. Kids ages 12 and younger can participate for free with their ticket to the game. Over 10,000 Easter Eggs will be hidden around UPMC Park for kids to find. The Easter Egg hunt will begin promptly at 11:30 a.m. as gates open. First pitch between the SeaWolves and Rumble Ponies will be at 1:35 p.m. The SeaWolves begin a three-game series against the Bowie Baysox at 6:05 p.m. It's Buck Night presented by Budweiser and Rocket 105. Fans can enjoy Smith's Hot Dogs, Pepsi fountain drinks, popcorn and select domestic draft beers for just $1 each! Save time and avoid ticket lines by purchase your tickets online and using mobile entry at UPMC Park! The SeaWolves continue their three-game series against Bowie at 6:05 p.m. It's Kids Eat Free & Two-Buck Tuesday. The first 250 kids ages 12 and younger receive a voucher good for a Smith's hot dog, Pepsi fountain drink and bag of Utz chips thanks to 94.7 BOB FM. Fans 21 and older can enjoy $2 drink specials exclusively in the Bud Light Beer Garden until the end of the sixth inning. The SeaWolves continue their series with the Baysox at 6:05 p.m. Be sure to arrive early as the first 1,000 fans will receive a SeaWolves Tumbler thanks to Pepsi. Fans can enjoy $3 specials on select domestic draft beers exclusively in the Bud Light Beer Garden until the game starts. Before the game, fans can meet C. Wolf and a SeaWolves player in the Team Store to get an autograph thanks to Plyler Entry Systems. Fans 18 & older can listen for the Fast Play Friday key word to text to win great prizes courtesy of the Pennsylvania Lottery. Be at the Game, You Must. Fans will enjoy intergalactic postgame Zambelli fireworks with a Star Wars theme. Fans are encouraged to dress as their favorite Jedi, Padawan, Droid or Wookiee and enjoy our galactic brand of fun thanks to Commonwealth Charter Academy. Before the game, fans can meet C. Wolf and a SeaWolves player in the Team Store to get an autograph thanks to Plyler Entry Systems. Where there's a piñata, there's a party! This season, the SeaWolves will play four games as the Erie Piñatas (May 5, June 18, July 28 & August 13), an alternate identity inspired by team owner Fernando Aguirre's childhood playing baseball and celebrating with friends and family in Mexico. Each Piñatas game day will feature Latin music, distinct food and drink offerings, high-energy traditions, and colorful caps and jerseys.